Doxy me services in Spanish? Hi! I was wondering if there are plans for having a multilingual option for this telemedicine service. Almost all of my patients speak Spanish, and sometimes they have difficulty with the check in, where you have to write your name to enter the waiting room. So…if there is a user wish list…having the service in Spanish would be great!!! Traducir nuestro sitio de internet al espanol es algo que hemos considerado para el futuro. Tenemos un tradato con informacion en espanol. Vea el tratado en. Genial Courtney! Eso sí es algo muy bueno. Yo creo que así con el servicio en español se puede llegar a un número mayor de personas. Vivo en España y a mí doxy.me me va genial y claro, es muy fácil de usar. ¡Estoy de acuerdo! Disponer de la interfaz en español sería muy útil. Además, abriría un mercado muy grande, tanto a las personas que trabajamos en países hispanohablantes, como a Doxy. De acuerdo! Me interesa mucho tener una variedad de idiomas. Nuestros prioridades incluyen Castellano, Polaco, Ruso y Portugues. 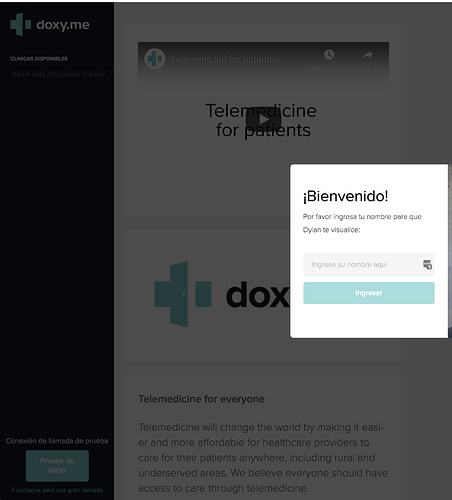 We now automatically detect is your patient’s browser language is set to Spanish and we update some of the text automatically like below! Que bien! This is great news! I’m in Spain and most patients of mine have no knowledge of English, so I would always have to explain that that window is asking them to write their name…now I don’t have to go through the extra hassle! Thanks doxy! As I offer our service in both English and Spanish my clients LOVE this feature. Thank you.